Cards by America: Let's Hit the Beach! This is a re-engineered card of mine too. 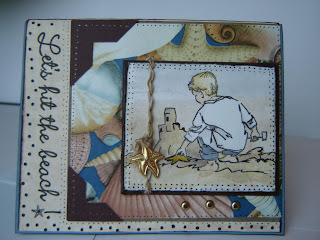 I took the stamped image and added stickles bling, a gold starfish cahrm, gold brads & fiber. It has been mounted on seashells wallpaper. That's right, I found this buy at 1/2 off by a register at biglots. Just had to get it to use on my summer/beach themed cards. Lots of doodling add to the overall look of the card. Wow I love this card America! The layout is fabulous and you did a wonderful job coloring the image! Great job!